Photos submitted to Times Observer U.S. Sen. Chuck Schumer visited the National Comedy Center with hopes that it would receive national recognition within two weeks. The legislation is included in the 2019 Lands Package and passed initial voting in the Senate on Thursday. P-J photos by Jordan W. Patterson. JAMESTOWN, N.Y. — New York Senator Chuck Schumer pushed for national recognition of Jamestown’s National Comedy Center last year, but no action was taken in the Senate. However, Schumer, brimming within confidence, said this year was different. “The official designation of the Jamestown comedy center as the national comedy center of the United States is about to happen,” Schumer said to a crowd inside the National Comedy Center on Friday. The Senate approved the legislation during initial voting Thursday and it’s anticipated additional Senate approval will be received Monday. Schumer was speaking from within an institution he helped secure funding for but had never visited until then. 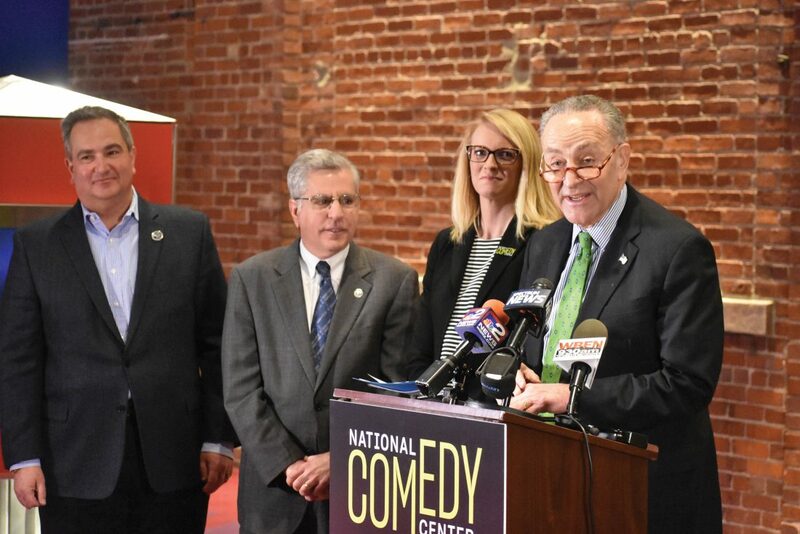 Minutes before Schumer took his first tour of the comedic entertainment facility, he announced to a room full of media, employees and community representatives that legislation was included in the 2019 Lands Package to give the comedy center the recognition. Schumer described comedy as “nature’s medicine” and said it was only right the sole national comedy center in the country is housed in Jamestown, the home of Lucille Ball. 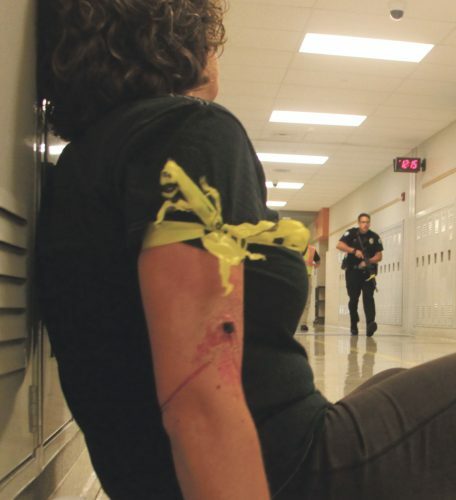 Rep. Tom Reed, R-Corning, passed similar legislation through the House of Representatives last year. Reed again reintroduced the legislation in January. Schumer commended Reed’s efforts during his address. Schumer was confident once the Senate approves the legislation, the House would approve it shortly after and be sent to President Donald Trump for his signature. “It will be signed by the President in two weeks and there’s nothing standing in the way. It’s all systems go. It’s going to happen,” he said to applause. The Democratic senator was joined by Journey Gunderson, National Comedy Center executive director; Sam Teresi, mayor; and George Borrello, county executive. “I believe what I said the last time we were here is true. We have built the national caliber cultural institution and attraction that the art form deserves, and the what the senator is doing helps make that official,” Gunderson said. Gunderson praised the efforts Schumer made to secure funding to help create what is now the National Comedy Center. Borrello and Teresi both thanked Schumer for his dedication to the comedy center and Chautauqua County. Borrello highlighted the bi-partisan political nature of the comedy center legislation. Teresi emphasized the importance of Schumer’s efforts to save the Erie-Lackawana Railroad Station, which “is the basis for the comedy center,” he said. The National Comedy Center is supported by over $14 million in resources from the state, including $4.4 million awarded through the Western New York Regional Economic Development Council; an additional $5 million through the Buffalo Billion II initiative; $5 million through the New Markets Tax Credit Program; and other state sources. The senator also helped secure the Dan Aykroyd Saturday Night Live motorcycle for the National Comedy Center. Officials at the comedy center reached out to the senator as a precautionary measure in case there were issues when shipping the motorcycle across the U.S.-Canadian border from Canada where the bike was being stored. Aykroyd rode the bike down Second Street during the Lucille Ball Comedy Festival in August. Schumer said the national status will help bring in more money to the Jamestown area. He explained that the national recognition opens up opportunities for the comedy center to more easily apply for funding.